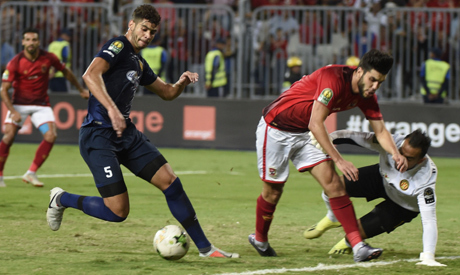 Ahly striker Walid Azaro will miss next Friday’s African Champions League final against Esperance of Tunisia in Rades as he has been handed a two-match ban by the Confederation of African Football (CAF) for disciplinary reasons. In a statement published on its official website on Monday, CAF said that after reviewing the footage of the Champions League final, the Chairman of CAF Disciplinary Board has decided to suspend Azaro for the next two matches “namely match. 148 E.S.T. [Tunisia] vs. Al Ahly Sporting Club [Egypt] and his next match during the CAF interclubs competitions”. Ahly have also been handed a fine of 20.000 USD. Ahly beat Esperance of Tunisia 3-1 at home on Friday but Azaro who took the center stage for the wrong reasons. The Moroccan striker has been awarded two penalties either side of the interval that sparked controversy as television replay showed there were minimal contacts. Azaro, who finished as the league’s top scorer last season, was also caught on camera ripping off his shirt claiming that it had been made by the Tunisian defender. The scene sparked outrage and the Tunisian Football Association held an emergency meeting on Saturday listing several demands to CAF including the suspension of Azaro for his “unsporting behavior and assaulting an Esperance player." On Saturday, Carteron asked for special protection for his team when they travel for the return match in Tunisia as he was hit by the foot of one of Esperance’s players following the first leg victory. The Ahly coach also said that Tunisian fans insulted Ahly players; insisting that these sad incidents spoiled the joy of the victory. “Ahly’s Coach, Mr. Patrice Carteron will be invited to appear before the Disciplinary Board for a hearing regarding allegations of unsporting behavior,” CAF statement added.